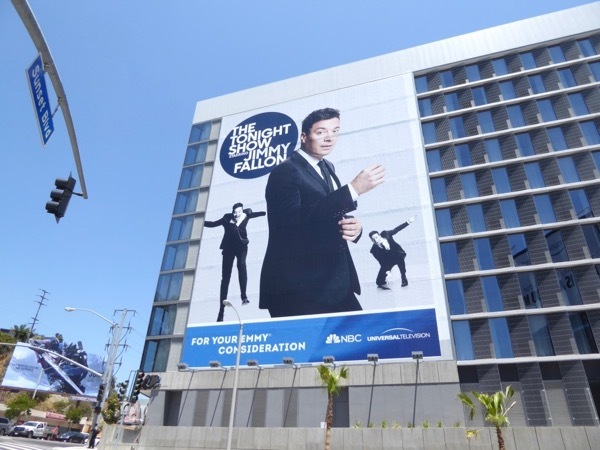 Start spreading the news, The Tonight Show is getting its newest host this Monday with the arrival of Jimmy Fallon to fill the seat of the popular Jay Leno after his 22-year tenure behind the desk. 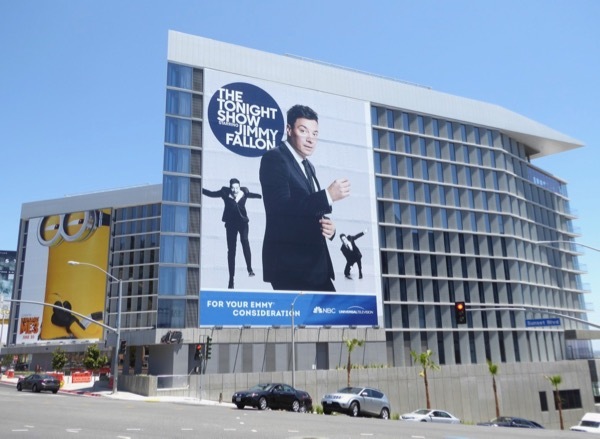 It may seem like a dream come true for the talk show host, but the gig can also be a bit of a poisoned chalice, as Conan O'Brien found out when he replaced Jay Leno on NBC's late-night talk show in June 2009. He only lasted nine short months until viewers bailed on him, maybe not understanding his brand of irony and satire. 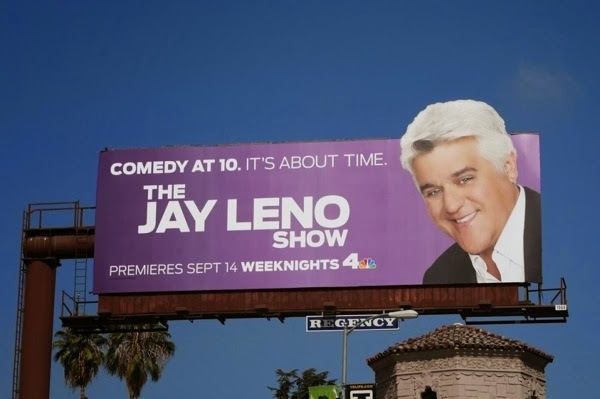 At the same time The Jay Leno Show didn't work in its new primetime slot either, so after retiring from hosting The Tonight Show, he returned again in March 2010, until he bowed out on February 6, 2014 with his highest audience in 15 years, when 14.6 million viewers tuned in to say goodbye. So, no pressure Jimmy Fallon. 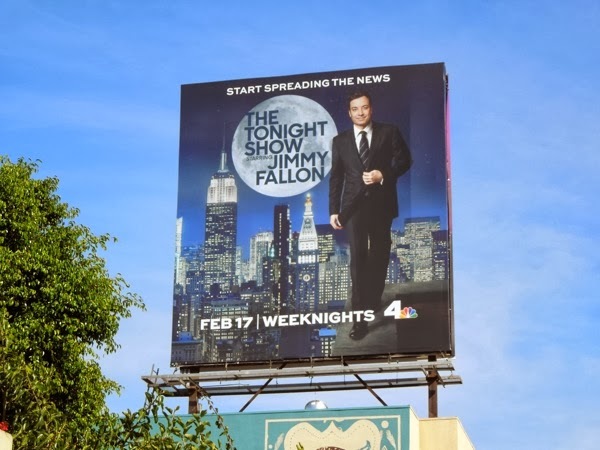 You only have to live up to The Tonight Show legends like Steve Allen, Jack Paar, Johnny Carson and Jay Leno (who it's worth noting wasn't an instant success when he first started). 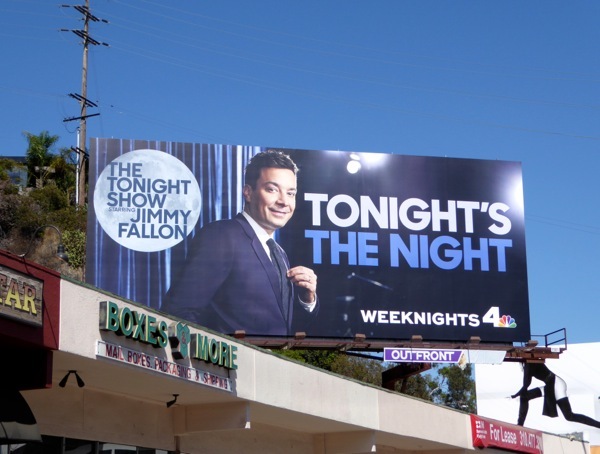 Let's hope your jokes, guests and format make the grade (and by the way does anyone think it's confusing that there are two late-night hosts with similar names, Jimmy Fallon and Jimmy Kimmel). 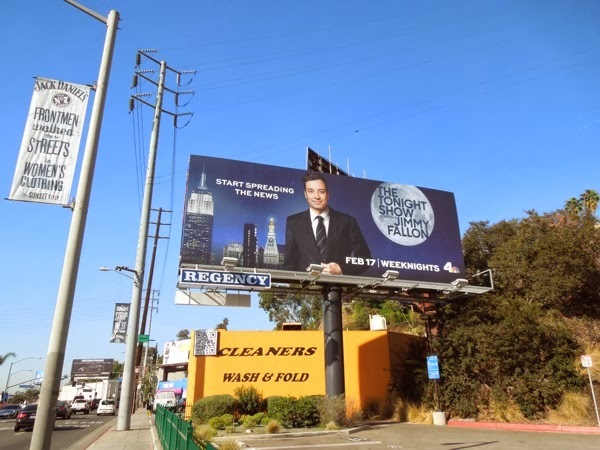 These nighttime New York cityscape-themed billboards for Jimmy Fallon's debut were snapped along Sunset Strip and Beverly Boulevard on February 11, 2014. 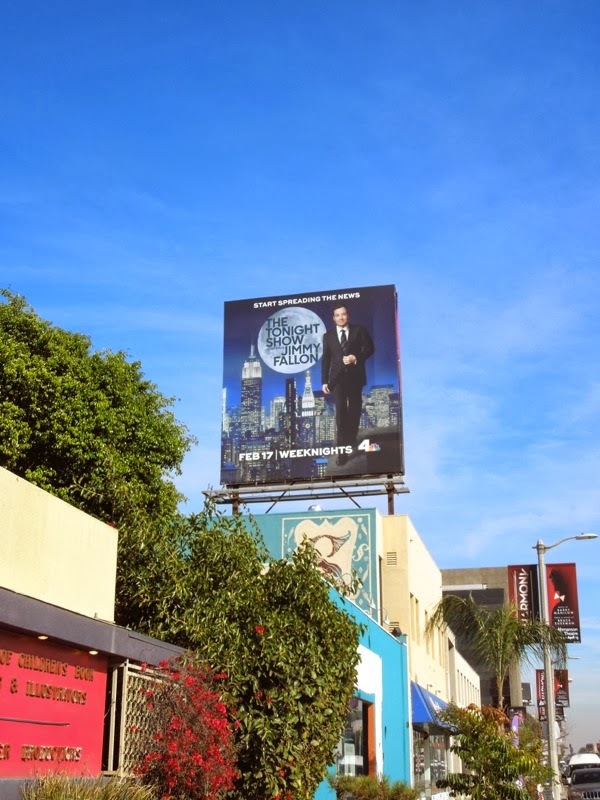 For another (funnier) way to advertise this show format, be sure to check out these Conan O'Brien talk show billboards (where he found a successful new home on TBS) and ads for Kathy Griffin's short-lived chat show (which lasted two seasons on Bravo). 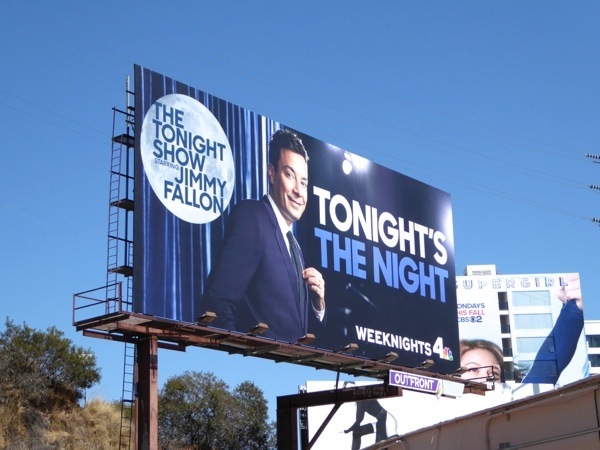 UPDATED: If you're a fan of the show, here's also the promo billboards for the new 2015 season of The Tonight Show with Jimmy Fallon snapped along the Sunset Strip on September 6, 2015. 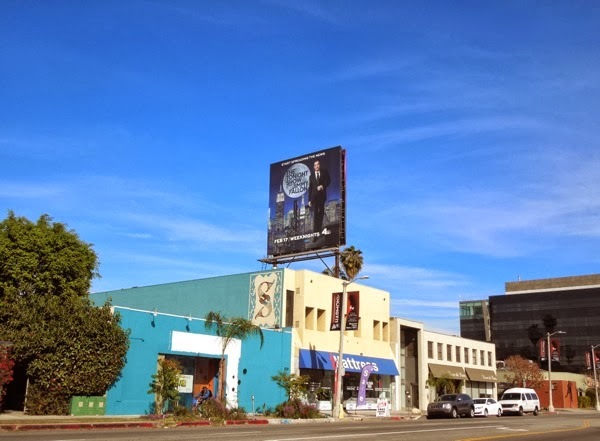 In addition here's also the Emmy nomination billboard to encourage TV Academy voters to give the talk show host their support, spied along Sunset Boulevard on August 23, 2015. 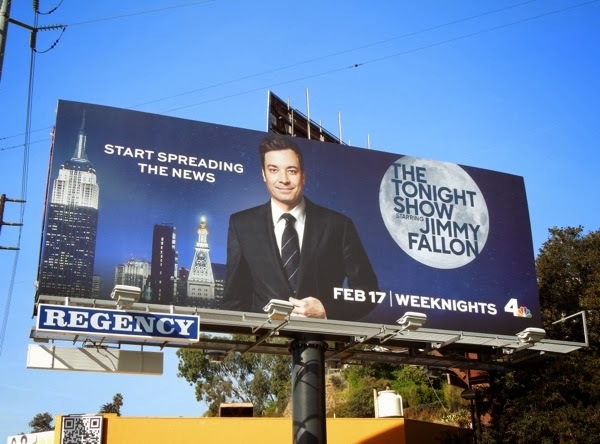 Jimmy's move to The Tonight Show seems to be the best thing he ever did, are you watching? 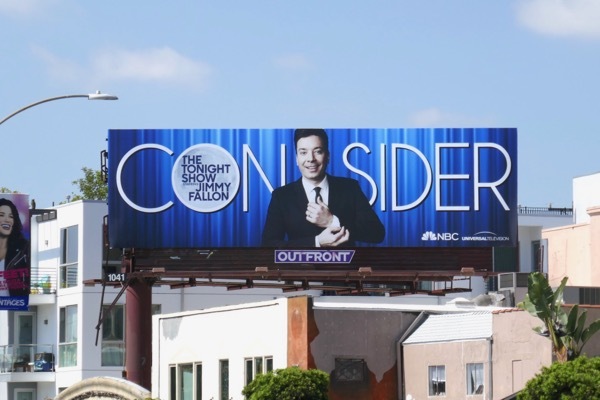 UPDATED: Jimmy Fallon may be struggling in the late-night ratings (that Donald Trump interview has certainly come back to bite him in the bum), but that doesn't mean that NBC isn't going to show their support in a big way for 2017 Emmy season. 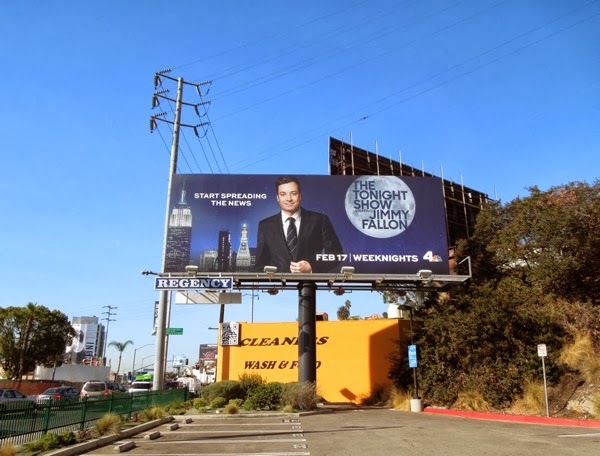 This super-sized Emmy consideration billboard for The Tonight Show host was snapped along West Hollywood's busy Sunset Strip on June 9, 2017. 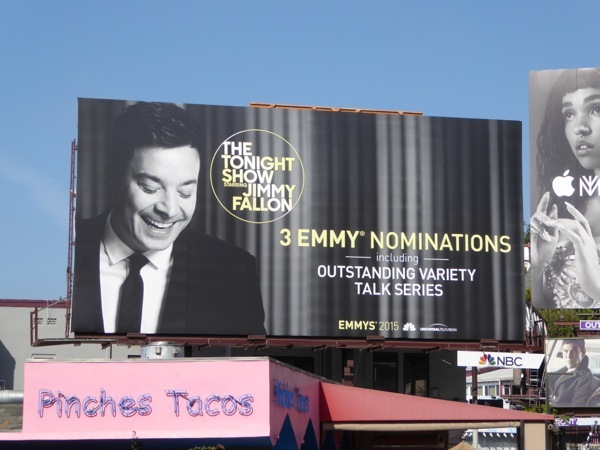 UPDATED: Here's also the 2018 Emmy consideration billboard for Jimmy Fallon, spotted along Fairfax Avenue on June 1, 2018.